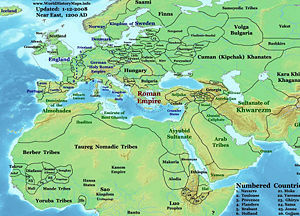 Near East in 1200 C.E., showing the Almohade Empire on the Iberian peninsula and Northwest Africa and its neighbors. The Almohad Dynasty (From Arabic الموحدون al-Muwahhidun, i.e. "the monotheists" or "the Unitarians"), was a Berber, Muslim dynasty that was founded in the twelfth century, and conquered all northern Africa as far as Libya, together with Al-Andalus (Moorish Iberia). The Almohad's were Islamic revivalists who set themselves the task of eradicating laxness and enforcing a strict and pious observance of Islam's rituals and laws. They chose an interpretation of the Qur'an that frowned upon the type of religious tolerance and inter-religious exchange for which al-Andalus had become renowned, and reversed the policy of previous rulers who had enabled this, resulting in Christians and Jews emigrating elsewhere. Their immediate predecessors, the Almoravids had already reversed earlier policy, regarding the Muslim princes of Andalusia as almost infidel since, at times, they entered alliances with Christians (although towards end of their rule, the Almoravids employed Christians as well). The Almohad's interpretation of the need for total dissimilitude between Muslims and non-Muslims was even stricter, similar to the teachings of Ibn Taymiyyah. They became more tolerant, though, towards the end of their rule. Ruling Andalusia from 1154, they withdrew to Marrakesh after defeat at the Battle of Las Navas in 1212 by a coalition of Christian princes. Marrakesh, their last stronghold, fell to the Marinids in 1269. The strict ideals with which they began did not survive once they acquired power. Initially, they frowned upon what they saw as unnecessary material extravagance. Later, they built some highly decorative mosques and palaces. The lifestyle suited to the rigors of an isolated mountain retreat may have been less easy to maintain in fertile Andalusia. As the charismatic leadership of their founder and his deputy gave way to routinized authority, a more pragmatic polity replaced reformist zeal. At times, they even entered alliances with Christians, which would have been anathema to the earlier caliphs. The dynasty originated with Ibn Tumart (1080 - 1130), a member of the Masmuda, a Berber tribe of the Atlas Mountains. Ibn Tumart was the son of a lamplighter in a mosque and had been noted for his piety from his youth although sources trace his ancestry back to Muhammad. He is said to have been of small stature, possibly with a physical deformity. He lived the life of a devotee-beggar. Around about 1108 he left to perform the hajj at Mecca (or "Makkah") and to study in Baghdad at the school founded by Abu al-Hasan al-Ash'arii. He is reported to have met al-Ghazali while visiting Damascus. He soon began to call for a return to the principles of Islam as set forth in the Qur'an and the traditions of the prophet Muhammad, and to stress God's Unity. It has been suggested, though, that what he taught was an eclectic mix of the teachings of his master with parts of the doctrines of others, and with mysticism imbibed from al-Ghazali. His main principle was a strict Unitarianism which denied the independent existence of the attributes of God as being incompatible with his unity, and was therefore a polytheistic idea. He denounced the Almoravids, whom his successor would defeat, as "anthropomorphists". After his return to Magreb at the age of 28, Ibn Tumart began preaching and heading attacks on wine-shops and on other manifestations of immorality. 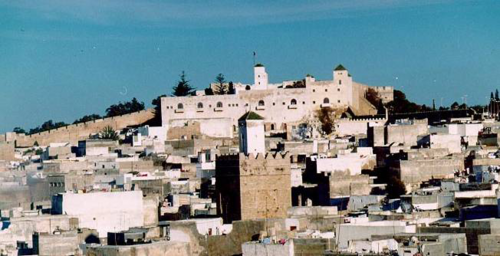 He even went so far as to assault the sister of the Almoravid (Murabit) Amir `Ali III, in the streets of Fez, because she was going about unveiled after the manner of Berber women. Ali III allowed him to escape unpunished. In 1121 he declared himself to be the Mahdi, openly claiming that he was sinless. March against these heretics and perverters of religion who call themselves the :al-Murabits, and call them to put away their evil habits, reform their morals, :renounce their heresy, and acknowledge the sinless Imam Mahdi. If they respond to your call, then they are your brothers; what they have will be yours, and :what you owe they will owe. And if they do not, then fight them, for the Sunna makes it lawful for you. Between 1130 and his death in 1163 al-Mu'min extended his power over all northern Africa as far as Egypt then entered Al-Andalus which he controlled by 1154. In 1170, his successor, Yusuf I, transferred the Almohad capital to Seville, where they built the great mosque (now replaced by the cathedral). The minaret, known as the Giralda was erected in 1184 to mark the accession of Abu Yusuf Ya'qub al-Mansur as the fourth caliph. It remains as the Cathedral bell-tower. They had now replaced the Almoravids, who has themselves entered Spain in 1086 invited by the Muslim princes to help defend them against the Christians. 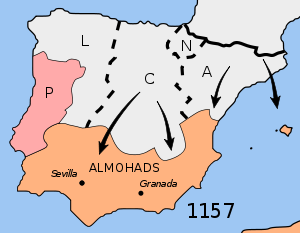 The Almohads may also have been invited to aid in the defense of Muslim Spain after the fall of Lisbon (1147). Clancy-Smith comments that both the Almoravids and the Almohads were "reluctantly enlisted" by the Muslim princes. Both dynasties, "entered al-Andalus specifically as defenders of the faith and functioned as politico-military elites whose position was validated by their ability to halt the Christian advance and to hold the frontier". From the time of Yusuf II (the sixth caliph), they governed Iberia and Central North Africa through lieutenants, treating dominions outside Morocco as provinces. When their emirs crossed the Straits it was to lead a jihad against the Christians before returning to their capital, Marrakech. The Almohad princes had a longer and a more distinguished career than the Murabits (or Almoravids). Yusuf II or Abu Yaqub Yusuf (1163–1184), and Ya'qub I or Yaqub al-Mansur (1184-1199), the successors of Abd al-Mumin, were both able men. In the end they became less fanatical than the Almoravids, and Ya'qub al Mansur was a highly accomplished man, who wrote a good Arabic style and who protected the philosopher Averroes. His title of al-Mansur, "The Victorious," was earned by the defeat he inflicted on Alfonso VIII of Castile in the Battle of Alarcos (1195). In 1212, Muhammad III, "al-Nasir" (1199–1214), the successor of al-Mansur, after an initially successful advance north, was defeated by an alliance of the four Christian princes of Castile, Aragón, Kingdom of Navarre and Portugal, at the Battle of Las Navas de Tolosa in the Sierra Morena. The battle destroyed Almohad dominance. Nearly all of the Moorish dominions in Iberia were lost soon after, with the great Moorish cities of Córdoba and Seville falling to the Christians in 1236 and 1248 respectively. After this, all that remained was the Moorish state of Granada, which after an internal Muslim revolt, survived as a tributary state of the Christian kingdoms on Iberia's southern periphery. The Nasrid dynasty or Banu Nazari (Arabic: بنو نصر) rose to power there after the defeat of the Almohads dynasty in 1212. Twenty different Muslim kings ruled Granada from the founding of the dynasty in 1232 by Muhammed I ibn Nasr until January 2, 1492, when Sultan Boabdil surrendered to the Christian Spanish kingdom, which completed the Reconquista. Today, the most visible evidence of the Nasrids is the Alhambra palace complex built under their rule. They were successful in expelling the garrisons placed in some of the coast towns by the Norman kings of Sicily. The history of their decline differs from that of the Almoravids, whom they had displaced. They were not conquered by a great religious movement, but lost territories, piecemeal, due to revolt by tribes and districts. Their most effective enemies were the Banu Marin (Marinids, who were related to the Umayyads) who founded the next dynasty. The last representative of the line, Idris II, "El Wathiq"' (the fourteenth caliph) was reduced to the possession of Marrakesh, where he was murdered by a slave in 1269. The minaret of the Koutoubia Mosque, Marrakesh, on which the Giralda was based. The Almohads far surpassed the Almoravides in fundamentalist outlook, and imposed restrictions and punitive measures on the dhimmis (protected communities} removing them from all government posts. Faced with the choice of either death or conversion, most Jews and Christians emigrated. Others were forcibly "removed to Morocco as potential fifth columnists in Iberis Some, such as the family of Maimonides, fled east to more tolerant Muslim lands, while others went northward to settle in the growing Christian kingdoms. It was not only non-Muslims who went into exile, or who chose to leave Almohad territory. Some Muslims also left, among them the Sufi teacher, Muhyi al-din ibn al-Arabi (1165-1240) who left Spain in 1200. Later, however, their policy changed. In their North African holdings, they encouraged the settlement of Christians even in Fez, and after the Battle of Las Navas de Tolosa occasionally entered into alliances with the kings of Castile. The mosque at Tin Mal is one of only two in Morocco that non-Muslims are allowed to enter. Most of the Almohads were buried in Tin Mal. The rise and fall of the Almohads fits the cyclical nature of Islamic history as described by Ibn Khaldun. He characterized Islamic history as cyclical in which zealous religious reformists such as the Almohads sweep into the towns from the desert, where a puritan lifestyle and strong group feeling are natural, establish rule then themselves become lax as the "toughness of desert life" is lost. Then group feeling is weakened to such a degree that the dynasty is "no longer able to protect itself" and before long it is "swallowed up by other nations". Their Marinide successors, who also ruled parts of Iberia, saw themselves as zealous reformers; "the Muslim successor states of the Almohads, the Nasrids of Granada and the Banu Marin of Morocco, both stressed their performance in the holy war or jihad against Iberian Christian powers to rally supporters to their cause and bolster their legitimacy". Clancy-Smith, though, is less convinced that Ibn Khaldun's theory applies to the initial success of the Almohads over the Almoravids, since according to her analysis the latter "remained firmly rooted," indeed too rooted, "in desert civilization" failing to adjust to life in Andalusia, or to attract a loyal local following. 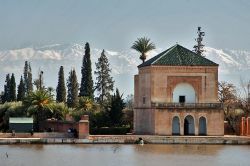 The Almohad's architectural legacy includes such mosques as the Koutoubia in Marrakesh and at Tin Mal and the Menara Gardens, with the Atlas in their background. ↑ Rebecca Weiner, 2008, Sephardim. Jewish Virtual Library. Retrieved May 18, 2008. Clancy-Smith, Julia Ann. 2001. North Africa, Islam, and the Mediterranean world: from the Almoravids to the Algerian War. (Cass series—history and society in the Islamic world.) London, UK: Frank Cass. ISBN 9780714651705. Fletcher, Richard A. 1992. Moorish Spain. New York, NY: H. Holt. ISBN 9780805023954. Guichard, Pierre. 2000. Al-Andalus: 711-1492. Paris, FR: Hachette Littératures. Hilliard, Constance B. 1998. Intellectual traditions of pre-colonial Africa. Boston, MA: McGraw-Hill. ISBN 9780070288980. Ibn Khaldūn, Franz Rosenthal, N. J. Dawood, and Bruce B. Lawrence. 2005. The Muqaddimah: an introduction to history. Princeton, NJ: Princeton University Press. al-Marrakushi, 'Abd al-Wahhab. 1997. "The Admirable in Abridgment of News from the West (1224)." 185-189. in Olivia Rene Constable. Medieval Iberia: Readings from Christian, Muslim, and Jewish Sources. Philadelphia, PA: University of Pennsylvania Press. ISBN 0812233336. O'Connor, I. 2003. "The Fall of the Almohad Empire in the Eyes of Modern Spanish Historians." Islam and Christian-Muslim Relations 14:145-162. This page was last modified on 7 March 2019, at 20:17.